Improving access to brain-based assessment: a pilot study of mobile EEG. While mental health problems are prevalent, the availability of services to assess and treat them is limited, particularly for underserved populations. Brain-based assessments may be useful to inform services for a variety of mental health problems in underserved populations. Thus far, current methods of brain-based assessments are generally costly and not widely available. The purpose of the present pilot study is to evaluate mobile EEG as a potential way to bring more brain-based assessments to the community. The current pilot study compares mobile wireless EEG to traditional wired EEG at three midline electrode sites (Fz, Cz, and Pz). The goal of this pilot study is to begin to establish mobile EEG as a tool for assessing brain function in underserved mental health settings. Paired sample t-tests of the P300 component of event related potentials (ERPs) measured during a standardized response inhibition task indicated that there were not statistically significant differences between the mobile and traditional EEG assessments. There were no statistically significant differences in ERP peak latency or peak amplitude at the electrode sites. This suggests that that mobile EEG may be a useful tool for reducing health disparities in underserved communities with limited resources while still providing similar results as traditional EEG. Brain, Electroencephalography, Event related potential, Health disparities. Due to decreased stigma and increased awareness, the prevalence of mental health problems has increased in the past two decades . However, only one in three people are able to access the services they require . In many parts of the United States, people must travel hundreds of miles to find appropriate mental health services [1,2]. Underserved populations pertaining to mental health can be defined as those who have a shortage in basic mental health needs based on factors including age, race, ethnicity, socioeconomic status, geography, as well as factors pertaining to mental health stigma . Given these unmet needs, an investigation of ways to increase mental health assessment and services in these regions as a step toward reducing health disparities is warranted. Mobile methods of brain assessment may be able to address gaps by improving the ecological validity of research samples as well as eventually addressing clinical needs in underserved populations. Given the need for increased mental health research and services, several major mental health organizations, including the National Institutes of Mental Health (NIHM) and the National Alliance on Mental Health (NAMI), have made improving access to mental health services and advancing access to research a top priority (National Institutes of Mental Health, 2009; National Alliance on Mental Health, 2015). The current pilot project aims to take an initial step forward in addressing this goal by examining ways to improving access to brain-based assessments. The use of brain-based assessments with underserved populations may help inform more effective paths to recovery through neural pathways that may be involved in mental health risk and resilience . Mobile electroencephalography (EEG) holds promise for conducting brain-based assessments in areas with limited resources as well as limited training in brain based assessment due to its portability, ease of use, and comparative low cost to traditional EEG [4-6]. However, the diffusion of mobile EEG for mental health purposes is still in its early stages. During EEG, the electrical activity of the outer layer of the brain, the cortex, is recorded. Conductive gel that contains salt and electrolytes allows for the transmission of electricity produced by the cortex to be recorded by the electrodes located on the scalp, which are then recorded on a computer. One way that EEG data can be interpreted is by studying event-related potentials (ERPs) . An ERP is a distinctive neural response that is produced by the brain following a specific event . ERP waveforms are readily observed changes in the EEG signal that can be detected at the same time as a given event, which is useful for time locking brain activity to various cognitive and behavioral tasks . There are different ways to interpret ERP waveforms. ERPs are commonly interpreted is by measuring the amplitude and latency of a component of the waveform. Amplitude is related to how much effort or input is put into a specific cognitive process at a given point in the ERP, with more cognitive effort corresponding to higher ERP amplitude . The highest point of a specific portion of the waveform, meaning the most amount of energy exercised into the process at that specific time, is referred to as the peak amplitude [8,10]. By contrast, ERP latency is the amount of time, measured in milliseconds, which elapse for a given portion of the ERP waveform to occur. The number of milliseconds in a given portion of the waveform indicates how long it took for an individual to respond to a stimuli [8-10]. The largest and most commonly studied component of the ERP is the P300, which is a large and positive component of the ERP waveform that peaks approximately 300 milliseconds after the onset of a stimulus related to the task . A common cognitive task that produces clear ERP signals, including the P300 component, is the inhibitory task known as the Go/NoGo task . The Go/NoGo task is a widely used cognitive task that measures response inhibition (i.e. the withholding of an inappropriate response during a given task . A Go/ NoGo cognitive task is an effective way to evaluate ERPs due to their high temporal resolution during these inhibitory processes . A typical Go/NoGo task consists of a Go condition where participants are expected to respond with a specific behavior after seeing a target stimulus. These Go trials are interweaved with NoGo trials in which participants are expected to inhibit their response after seeing a different stimulus. Thus, participants are supposed to respond to Go trials and inhibit responses to NoGo trials. Measuring P300 during a Go/NoGo task is ideal for comparing EEG devices due its widely established use, robust EEG signal and ease of experimental execution [8,13]. Understanding brain function associated with mental health problems could help to identify strengths and weaknesses associated with recovery as well as to develop specialized treatments to address individual issues. Typically, EEG data have been collected using a wired system with many cables and connections. Limitations of the traditional wired EEG include lack of mobility and high cost of equipment; the term “traditional EEG” will be used to refer to the wired multi-channel EEG that is commonly used in research and clinical settings. The purpose of the present pilot project is to compare mobile EEG to traditional EEG. The term “mobile EEG” will be used to refer to the mobile, wireless EEG system that has been less commonly used in research settings. The mobile EEG system’s midline channel locations (i.e., frontal (Fz), central (Cz) and parietal (Pz)) are the same as the traditional EEG’s positions, which will be directly compared in the present pilot study. The purpose of this pilot project is to provide initial evidence of the comparability of mobile EEG is to traditional EEG by assessing ERP amplitude and latency at the same electrode sites during the Go/NoGo response inhibition task with both EEG systems. We hypothesize that mobile EEG will yield the same level of interpretability and values for EEG readings of peak amplitude and peak latency as traditional EEG; this has yet to be compared for clinical or research purposes. Data were collected during one semester in an Institutional Review Board approved study of 18 college students at a university in the southeastern United States. Demographics are presented in Table 1. Participants were compensated with course credit. Principal investigator, K.N., a licensed psychologist, was present to monitor safety. Table 1. Demographic characteristics of pilot sample (N=18). Participants were recruited via the departmental subject pool and completed informed consent prior to participation. Basic demographic questions (i.e. age, ethnicity, and gender) were collected followed by the EEG. The order of traditional EEG or mobile EEG was counterbalanced to control for fatigue and practice effects. To standardize the placement of the caps with both assessments, the circumference of the head was measured in centimeters. This measurement around the head allowed for us to find the direct center of each participant’s forehead to ensure that the three electrodes (Fz, Cz, and Pz) were in the same place in both measurements. Then, the participant completed the same auditory Go/NoGo task counterbalanced for each of the EEG systems (traditional and mobile). A standardized twelve-minute auditory Go/NoGo task was administered to participants to measure response inhibition while EEG was recorded in the same manner with the each of the systems (Falkenstein, Koshlykova, Kiroj, Hoormann, & Hohnsbein, 1995). First, a baseline EEG measurement was taken before the Go/NoGo task by having the participant sit with their eyes open then closed, with minimal movement. Then the Go/NoGo task began, which consists of sound pairs that are either the same, low-low (i.e., NoGo), or different, low-high (i.e., Go). Participants were asked to respond to the low-high pairing by clicking a button and to inhibit their response to the low-low pairing by not clicking. The task consisted of 50 total trials, 25 Go stimuli and 25 NoGo stimuli. For this pilot project, we were measuring brain activity for both the Go and NoGo conditions of the Go/NoGo task. The traditional EEG was recorded using a 64-channel EEG BioSemi system. The set up for this system takes approximately 20 minutes with two study staff members. After securing the cap to the participant using the cap’s chinstrap, each of the 64 electrode ports are filled with conductive gel. The traditional EEG system is directly wired to the computer recording the EEG as well as to the computer administering the Go/NoGo task. The mobile EEG was recorded using an 8-channel g. Nautilus wireless system. The set up time is approximately 5 minutes with one study staff member. After securing the cap with the chinstrap, each of the eight ports in the mobile EEG were filled with g. Gamma gel, a specialized conductive gel for the mobile EEG. The mobile EEG system’s base station, which wirelessly synchronizes to the cap on the participant’s head, connects to a desktop computer via parallel port and universal serial bus (USB) cord. This connection allows the cap to record the EEG and communicate with the computer during the Go/NoGo task. Traditional EEG data were analyzed at three (i.e., Fz, Cz, and Pz) electrode sites recorded using EEGLab and ERPLab functions, specifically designed to operate with MatLab based on the methods developed by Lopez-Calderon and Luck, which can be found on the ERPLab Toolbox website . Data were segmented before and after each stimulus presentation beginning 200 milliseconds prior to the stimulus and ending 800 milliseconds after the stimulus. Standardized steps were followed to reduce electrical noise and participant movement (e.g., blinking, facial movements, or body readjustments during the task), which can impact the ERP signal . The ERPs were created using ERPLab to extract the P300 component of the ERP waveform for the three electrode sites Fz, Cz, and Pz in the two conditions Go and NoGo. The P300 portion of the ERP waveform was then used to determine peak latency and peak amplitude. Peak latency is defined as the time in milliseconds between the beginning and the peak of the P300 portion of the ERP waveform. Peak amplitude is defined as the highest point of the P300 portion of the ERP waveform as measured in microvolts. This process was completed in a standardized manner for each dataset as delineated by Lopez-Calderon & Luck . Mobile EEG was recoded using g.Tech’s Highspeed Online Processing blockset, which is operated through Simulink in Matlab. The channels (Fz, Cz, and Pz) on the mobile EEG were located in a standardized manner for all participants using MatLab. Then, the steps for extracting mobile EEG data for peak amplitude and peak latency were the same as the traditional EEG data as described in the previous paragraph. In the present study, data analyses were conducted using paired t-test analyses to compare the traditional EEG and the mobile EEG at the same three electrodes. For each subject, both peak latency and peak amplitude for the P300 component of the ERP were measured at three central electrode sites, Fz, Cz, and Pz for the Go and NoGo conditions of the response inhibition task, which was six comparisons for peak latency and six for peak amplitude. A Bonferroni correction was employed to correct the alpha level for multiple comparisons (alpha =.008). Demographic characteristics of the sample are summarized in Table 1. In evaluating our EEG data, we had >90% interpretable data with both traditional EEG (93%) and mobile EEG (91%). There was not a statistically significant difference in the interpretability rates of these EEG methods (p=.331). As shown in Table 2 and Figure 1, there were no statistical differences between the traditional and mobile EEG recordings for peak latency as measured at the P300 of the ERP during the Go/NoGo task at any of the electrode sites: Fz, Cz, and Pz. There were no significant statistical differences in peak latency between the traditional EEG and mobile EEG at the frontal (Fz) electrode in the conditions Go, t (17) = 1.932, p = 0.070, or NoGo, t (17) = 0.749, p = 0.464. Continuing on to the central electrode (Cz), there was no significant difference between the traditional EEG and the mobile EEG for peak latency in the condition Go, t (17) = 1.800, p = 0.090, or NoGo, t (17) = -0.424, p = 0.677. At the Pz site, there was no significant difference in peak latency for the condition Go, t (16) = 1.463, p = 0.163 or NoGo condition, t (16) = .061, p = 0.952. 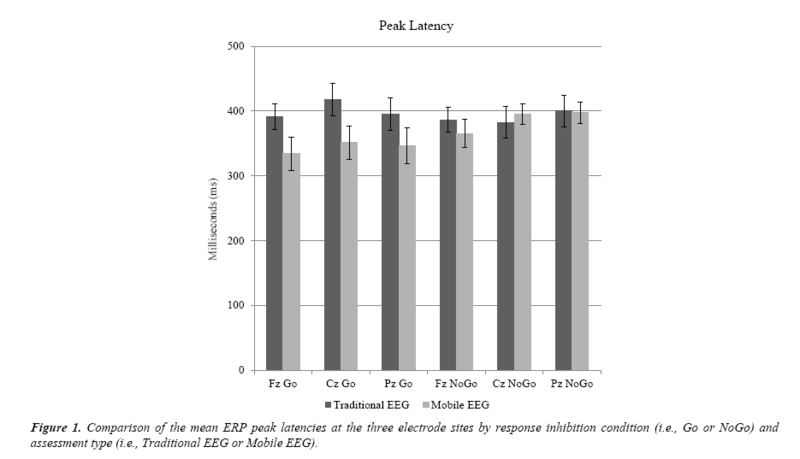 Figure 1: Comparison of the mean ERP peak latencies at the three electrode sites by response inhibition condition (i.e., Go or NoGo) and assessment type (i.e., Traditional EEG or Mobile EEG). As shown in Table 2 and Figure 2, there were no differences in peak amplitude at Cz and Pz, but there were differences for Go and NoGo at Fz. However, after factoring in the Bonferroni alpha adjustment of .008 , there was not statistical significance for peak amplitude in the Fz conditions Go, t (17) = 2.972, p = 0.009 or NoGo, t (17) = 2.311, p = 0.034. There was no statistical significance at Cz for peak amplitude for the condition Go, t (17) = -0.143, p = 0.888 or NoGo, t (17) = 0.774, p = 0.449. The parietal electrodes (Pz) were also not statistically significant for peak amplitude at Go, t (16) = 0.837, p = 0.415 or NoGo: t (16) = 0.985, p = 0.339. 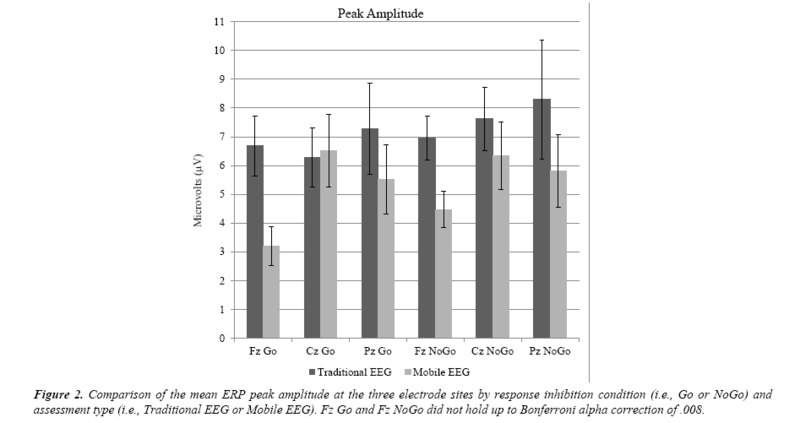 Figure 2: Comparison of the mean ERP peak amplitude at the three electrode sites by response inhibition condition (i.e., Go or NoGo) and assessment type (i.e., Traditional EEG or Mobile EEG). Fz Go and Fz NoGo did not hold up to Bonferroni alpha correction of .008. Table 2. 95% confidence intervals of the mean difference for traditional EEG versus mobile EEG at each of the three electrode sites for the Go and NoGo conditions of the response inhibition task as measured by ERP peak latency and peak amplitude. *Bonferroni alpha correction for multiple comparisons is .008. TEEG: Traditional EEG; MEEG: Mobile EEG; Fz: Fronta0; Cz: Centra;. Pz: Parietal. A step toward expanding brain-based mental health assessment and services to underserved populations is systematically evaluating new tools that could be used in these regions. This pilot study took a first step in bringing brain-based assessments to underserved populations by evaluating mobile wireless EEG in comparison to traditional wired EEG. We found support for our hypothesis that mobile EEG measurements (peak latency and peak amplitude) are comparable to traditional EEG. There were no statistically significant differences between the two types of assessment (traditional EEG versus mobile EEG) at any of the analyzed electrode sites (Fz, Cz, or Pz) for the ERP peak latency or peak amplitude measured during the response inhibition task in either of the presented conditions (Go or NoGo). The current findings are in keeping with prior work that also found mobile EEG to be comparable to traditional EEG [4-6]. However, the present study extended prior findings by evaluating mobile EEG for clinical purposes. This begins to fill an important gap, as the prior research of mobile systems focused on recreational use for gaming or other similar activities, while the present pilot work focuses on applications for mental health. This is the first pilot study to evaluate a mobile brain-based assessment that could be brought into the field to serve clinical needs in underserved populations. There are several reasons why the ERP measurements were comparable for mobile versus traditional EEG. Peak latency is considered to be a reliable and stable measure of ERP as compared to peak amplitude [8-10], therefore, it was expected to be equivalent across devices (mobile EEG vs. traditional EEG). Peak amplitude is also widely used in EEG research and for that reason it was included in the present study along with peak latency. However, peak amplitude has been regarded as a less stable measure of ERP , given that, it was not surprising that two amplitude conditions (Fz Go and NoGo) approached statistical significance but did not retain significance after alpha correction. Factors pertaining to inconsistencies in peak amplitude between different brain assessment types readily explain these apparent but not statistical differences. For example, peak amplitude is easily influenced by noise. Noisy data will have a higher peak ERP amplitude, which is not an accurate but instead illustrates poorer quality data . While the data in the present pilot study fell well within accepted parameters for noise for both the mobile and traditional EEG, it is possible that small differences still played a role. Peak latency is not as easily impacted by noise and therefore, it is often recommended in ERP research in favor of or in addition to peak amplitude [8-10]. Given that there were not statistically significant differences in latency or amplitude measurements for the mobile versus the traditional EEG systems, it is reasonable to conclude that this pilot study provides some preliminary evidence that the two systems are comparable for detecting ERP P300 responses [14-18]. There were several limitations to this pilot study of mobile EEG that future research should consider. This pilot study was conducted with a small college sample in a lab. Since it provided some evidence that mobile EEG is comparable to traditional EEG, future studies should use a larger number of participants from the community and should conduct the study in a community setting. Gel interference was also a limitation. The gel used with the mobile EEG cap was of a thicker consistency than that of the traditional EEG. This led to difficulties when the mobile EEG was counterbalanced to go first because the mobile EEG gel left residue on the participant’s head that interfered with the traditional EEG’s signal. This was detected before the study began, so it did not interfere with the traditional EEG; however, it took up additional study time to carefully wipe the participant’s hair with moist hypoallergenic towelettes. This remedied the problem; however, dry or gel-free mobile EEG systems should also be explored pertaining to this issue. Fatigue was also a limitation [19-21]. Although our study was brief and we counterbalanced the EEG assessments, participants tended to move more in the second EEG assessment. This did not impact data interpretability but future research could consider having participants undergo each assessment on different days to decrease issues with fatigue as well as with gel [21-25]. This study sought to provide initial pilot evidence for use of mobile EEG as a way of beginning to address the need for more brain-based assessments in underserved populations. The mobile EEG device studied in this pilot study provided the same interpretability of ERP results as traditional EEG, providing initial support of the use of this mobile technology in community settings. Future research should consider using larger, more diverse samples, a wider range of cognitive tasks, and conducting studies directly in a community clinic. Mobile brain-based assessments may have the capability to help answer a broader spectrum of research and clinical questions for individuals in underserved populations, thus improving understanding of the prevention and treatment of mental health problems for individuals in these unique settings. Tolan PH, Dodge KA. Children's Mental Health as a Primary Care and Concern:A System for Comprehensive Support and Service. The American Psychologist. 2005;60(6):601-14. Insel TR, Quirion R. Psychiatry as a Clinical Neuroscience Discipline. JAMA. 2005;294(17):2221-4. Debener S, Minow F, Emkes R, et al. How about taking a low?cost, small, and wireless EEG for a walk? Psychophysiology. 2012;49(11):1617-21. Kranczioch C, Zich C, Schierholz I, et al. Mobile EEG and its potential to promote the theory and application of imagery-based motor rehabilitation. International Journal of Psychophysiology. 2014;91(1):10-5. Brandeis D, Lehmann D. Event-related potentials of the brain and cognitive processes:Approaches and applications, Neuropsychologia. 1986;24(1):151-68. Luck SJ. An introduction to the event related potential technique (2nd ed. ), 2014. Cambridge: MIT Press. Sur S, Sinha VK. Event-related potential:An overview. Industrial Psychiatry Journal. 2009;18(1):70-3. Clayson PE, Baldwin SA, Larson MJ. How does noise affect amplitude and latency measurement of event?related potentials (ERPs)? A methodological critique and simulation study. Psychophysiology. 2013;50(2):174-86. Duncan CC, Barry RJ, Connolly JF, et al. Event-related potentials in clinical research:Guidelines for eliciting, recording, and quantifying mismatch negativity, P300, and N400. Clinical Neurophysiology. 2009;120(11):1883-908. Bokura H, Yamaguchi S, Kobayashi S. Electrophysiological correlates for response inhibition in a Go/NoGo task. Clinical Neurophysiology. 2001;112(12):2224-32. Smith JL, Douglas KM. On the use of event-related potentials to auditory stimuli in the Go/NoGo task. Psychiatry Research: Neuroimaging. 2011;193(3):177-81. Lopez-Calderon J, Luck SJ. ERPLAB: An open-source toolbox for the analysis of event-related potentials. Frontiers in Human Neuroscience. 2014;8:213. Bell E. Young persons in research: A call for the engagement of youth in mental health research. The American Journal of Bioethics. 2015;15(11):28. Bio Semi. 64 channels Medium (Red) 10/20 layout. 2016. Falkenstein M, Koshlykova NA, Kiroj VN, et al. Late ERP components in visual and auditory Go/Nogo tasks. Electroencephalography and Clinical Neurophysiology/Evoked Potentials Section. 1995;96(1):36-43. Huster RJ, Enriquez-Geppert S, Lavallee CF, et al. Electroencephalography of response inhibition tasks:Functional networks and cognitive contributions. International Journal of Psychophysiology:Official Journal of the International Organization of Psychophysiology. 2013;87(3):217-33. Johnstone SJ, Pleffer CB, Barry RJ, et al. Development of inhibitory processing during the Go/NoGo task:A behavioral and event-related potential study of children and adults. Journal of Psychophysiology. 2005;19(1):11-23. Loo SK, Lenartowicz A, Makeig S. Research review:Use of EEG biomarkers in child psychiatry research – current state and future directions. Journal of Child Psychology and Psychiatry. 2015;57(1):4-17. Polich J. Updating P300:An integrative theory of P3a and P3b. Clinical Neurophysiology. 2007;118(10):2128-48. Taylor MJ, Baldeweg T. Application of EEG, ERP and intracranial recordings to the investigation of cognitive functions in children. Developmental Science. 2002;5:3180-334. Tuchman R. Treatment of seizure disorders and EEG abnormalities of children with autism spectrum disorders. Journal of Autism and Developmental Disorders. 2000;30(5):485-89. Wang J, Barstein J, Ethridge LE, et al. Resting state EEG abnormalities in autism spectrum disorders. Journal of Neurodevelopmental Disorders. 2013;5(1):24-24.